FREE Internet Access and Airport Shuttle based upon availability between 7am-7pm. 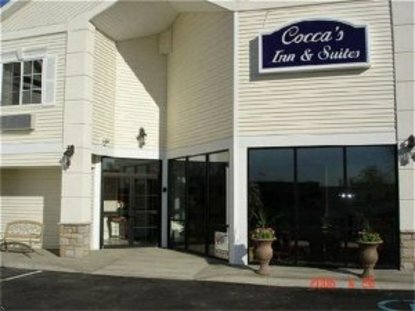 Cocca's Inn and Suites will give you the comfort of being at home. The Albany/Wolf Road location is minutes from the Albany Airport, Restaurants and Shopping. There is a variety of different rooms, including the new interior boutique style deluxe rooms, jacuzzi rooms and exterior queen rooms. All rooms offer a free limited continental breakfast, free internet access, free local calls, refridgerator, coffeemaker, cable TV with HBO. The deluxe and jacuzzi rooms also have microwaves, iron/iron boards, hairdryers, DVD Players and offer a free limited breakfast at the nearby IHOP Restaurant on Wolf Rd. Guests can use the business center which offers free limited computer use, faxing, printing and copying-for a fee.